In his book How to Adapt Anything into A Screenplay, Richard Krevolin admits that his method actually describes how to adapt anything into the Hollywood template. 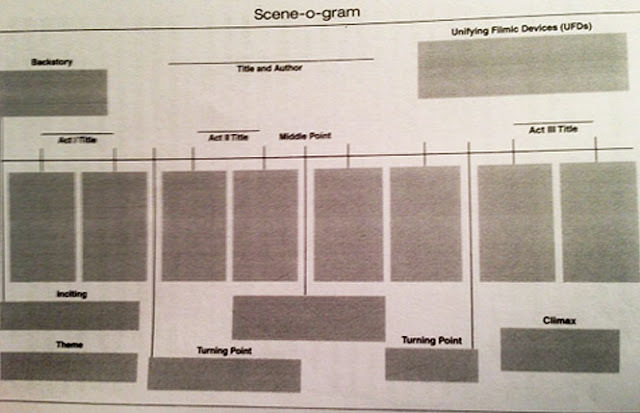 He includes this "scene-o-gram" in his book, mapping the three-act template of the screenplay, with the crucial turning-points punctuating the structure. As a visualization of structure, the layout evoked a tarot spread, which is not surprising considering the correlation of the three-level matrix of the major arcana with the screenplay form, mediated by the tradition of "the hero with a thousand faces." Since the shape of our tarot spread is open (for the Prezi map), it could be interesting to test the syncretic capacities of our own adaptation to konsult: can a Prezi configuration evoke together a tarot spread and a Hollywood scenario? Gregory L. Ulmer is Professor of English and Media Studies at the University of Florida, Gainesville FL. He is coordinator of the Florida Research Ensemble. The purpose of this blog is to develop and test the equivalent of a metaphysics for the digital apparatus: electracy. Image of Thought in Electracy: Success or Failure?